This nomination has been way to long in coming imho. I had thought others would nomintate the past 3 cycles so I deferred. Rip's is what the GNR program is about in my mind, out of the way places, places whose legend spreads by word of mouth, places the everyman can afford, places that have character & characters working there, places that do one or two things and do them great, places that have been around for ever. Rip's is all of the above & then some. Rip's has been doing what they do in Ladd, IL. for the past 75 years, since 1936 at its current location. I have known of Rip's since well before I moved out to the IRV, and have been a customer for years. Menu is limited to fried chicken(1/4 dark or 1/4 light), fish on Fridays, chicken strips, fried mushrooms & drippings and pickles. The chicken, IRV tavern style, is the star of the show, I personally have not found a better fried chicken around, some have come close in the IRV, and even tied Rip's on particular nights but none have beaten them. Always served piping hot from the fryer, crunchy crust, tender juicy interior. Chicken nirvana. Other items are solid as well, but the chicken is where its at. I mentioned affordable upthread, I think thats important, we all cant or in most cases dont care to drop $100 - $200 dollars on a meal, its important to have GNR options at the lower end of the spectrum. A person could easily go to Rip's get full on fried chicken and beer and not spend more than a $20 bill. Expect a line on Friday nights, Saturdays & Sundays. Really nothing more to add after those threads, Rip's and their chicken speak for themselves. Rip's is a special place, great nomination, I'm happy to second it! So happy to see this nomination since I've been wanting to try this place for ages--hoping we can get an "evaluation" dinner scheduled ASAP!! Anyone else? Id organize a visit if folks would come out. boudreaulicious wrote: So happy to see this nomination since I've been wanting to try this place for ages--hoping we can get an "evaluation" dinner scheduled ASAP!! Anyone else? Same here. After looking at the other threads I'm ready to go now! Seriously though, the timing may be a bit tough for me in the coming weeks but I'd love to go if I can. A night next week is my best shot though I know that might not be the same for everyone else. Otherwise I'm looking in April which seems too far since I've been craving fried chicken. I've actually eaten at Rip's several times thanks to the wisdom of jimswside who has been my culinary guide to the area. Sitting at the bar, watching a Cubs game, (sorry Jim) eating the amazing chicken and having a cold beer are all highlights of my hiking trips to Starved Rock, and don't forget the mushrooms. Then go across the street to Lanuti's and get a ice cream grasshopper made from scratch at a wonderful old bar. GNR material for sure. Fantastic nomination, Jim! I wish I would have thought about nominating them. I have been going to Rips for about 20 years now, and also believe that this is the type of place that GNR program was founded to recognize. The menu is minimalist (light or dark), but the chicken is terrific. Rips was certainly among the top performers at the chicken crawl a couple years ago, and I have yet to have better in the state. I strongly support this nomination! Is there any restaurant that can contribute to clogging the arteries of its patrons any better than with the crispies? Did a visit get organized yet? If you didn't go at the earlier suggested date, I'd be interested in joining. Jean Blanchard wrote: Did a visit get organized yet? If you didn't go at the earlier suggested date, I'd be interested in joining. not yet, my schedule right now is not jibing with the GNR discussion window. I have only been to Rip's once, but it was surely worth the trip, and the recognition. I hope to join you on the 31st, too, but not sure yet. I had an excellent meal at Rip's last night. I posted about it here. I have liked Rip's for at least six years. 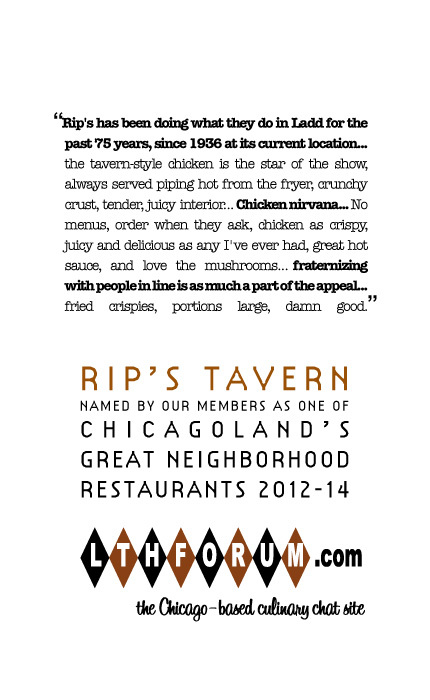 As recapped by Stevez, I really enjoyed my introduction to Rip's and agree that it is a great nomination--both for the Ladd-fried deliciousness and the quirky, off-beat nature of the place. No menus, order when they ask while waiting in the bar or forever hold your peace, and two beers for $4.50. Chicken as crispy, juicy and delicious as any I've ever had. Great hot sauce (Frank's mixed with what??) Loved the mushrooms--I actually really dislike fried mushrooms b/c I've never had good ones--you know what I mean--you bite into them and they're watery, rubbery and the moisture causes the breading to fall right off?? Those mushrooms? These were not those. They actually tasted like...mushrooms!! Great place and GNR for sure! Juicy chicken with light crunchy batter. The wing was my favorite part of the bird, will need to make it out on Wed or Thur when they have wings only special, doused in their hot sauce.